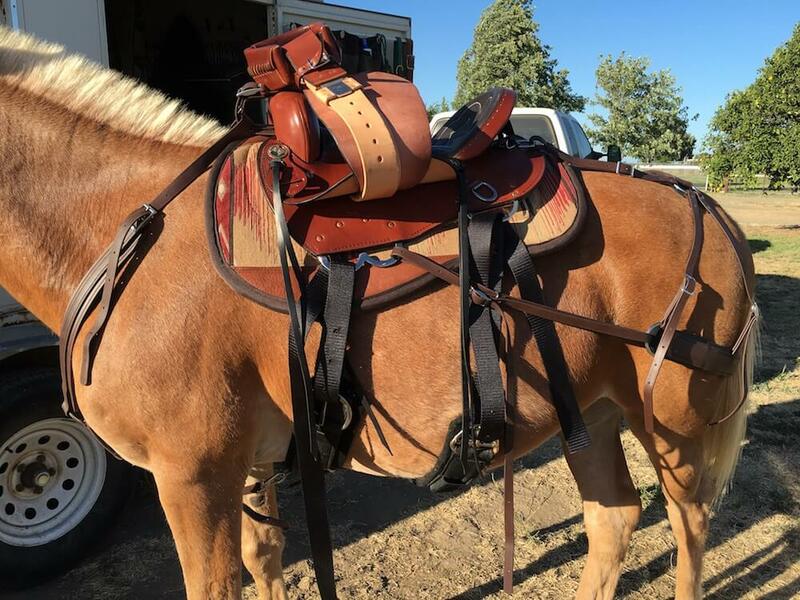 You have learned everything you need to know about mule saddles, you’ve read about the difference having a true mule saddle makes from other mule owners – a Steve Edwards mule saddle 😉 – and now you’re ready to purchase. The last question is, what mule tack do I need to go along with the new mule saddle? 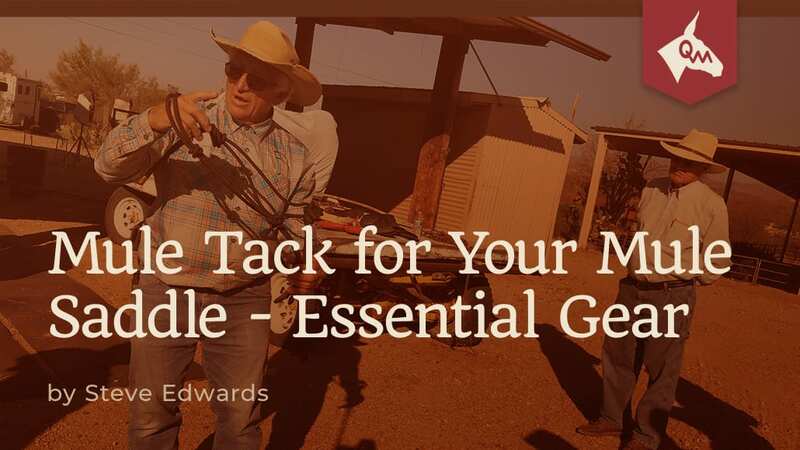 Before we get into a list of recommended items, it is very important for mule owners to understand WHY certain tack is essential to pair with your mule saddle and why it is essential that the tack be installed in a very particular way. The most important difference between the horse saddle and mule saddle is that the tree has true mule bars – Steve Edwards mule bars. Without true mule bars, your saddle is going to slide forward. However, you’ve already made the decision to buy a Steve Edwards saddle. Won’t that solve the sliding forward problem? No. It’s a first step, but it’s imperative to understand that the saddle will still slide forward because the mule is built by the good Lord in such a way that it will always slide forward. It doesn’t make any difference if you’re riding on flat ground or mountains. To keep the saddle from sliding forward, you must ride with a breeching, not a crupper. 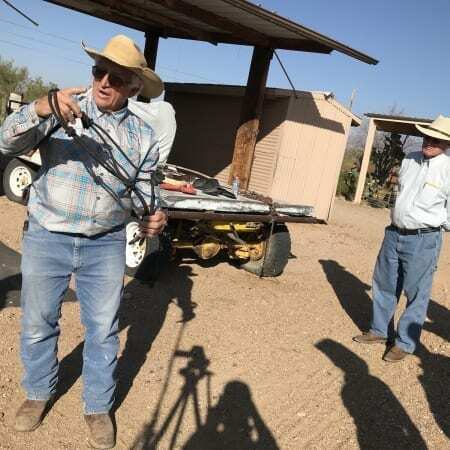 Folks will ride with a crupper on their mules, but what they don’t understand is that the mule and donkey tail is all bone – if enough weight is placed on that crupper, it can break the tail and from there, destroy an otherwise awesome mule. In this picture, the britchen is properly adjusted for riding down a steep mountain. This is not suitable for flat ground. Your britchen is not meant to hold the saddle back – it is to prevent the saddle from moving forward. Each time the hip comes back, it keeps the saddle in place. The rear cinch is ultimately what keeps the saddle in place. The britchen is essential because as you ride, when the saddle moves forward, the breeching bumps the rump to prevent the saddle from moving forward. That’s exactly what you want. Folks will try to take shortcuts to compensate for using a horse saddle on a mule or not investing in the right tack by buying a saddle pad to ‘fix’ problems. Folks, the gimmicks of shims on saddle pads does nothing but create future problems. I see it all the time, “Oh, Steve, I made this one little change and now he’s not giving me problems no more…” yeah, you may have ‘fixed’ one problem with a shortcut, but you’ve just created three future problems that are going to be much worse. 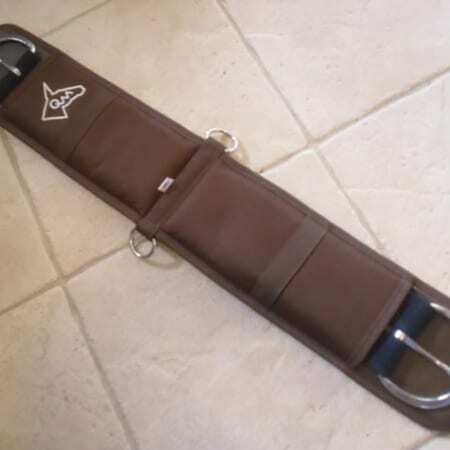 A mule saddle pad is meant to be used with the mule saddle. If you’re trying to prevent the mule from bucking, running off, or biting then listen to him – he is saying, “I have a back problem,” so you need to change what you’re doing. Fortunately for you, you’ve already decided to ease your mule’s pain with a true mule saddle and because of that, you will get the full benefit a mule saddle pad has to offer. Owning a mule is not like owning a horse. Sure, they’re equine, sure they’re related, but golly, the days of, “an equine is an equine is an equine,” are just gone. We know better. And now that we know better, we know that the saddle needs to be secured with two cinches – one in the front, nice and loose and one in the back, snug and secure. When you ride with one cinch, the saddle is not secure on the mule’s bone structure and an insecure saddle means restriction on the mule’s overall movement. People think, “Oh, he really did great” after a couple short rides. Now, you’re ready to go on a 5-day ride, and one day in, you have a mule that starts acting up. The mule was communicating the entire time, “Hey, this saddle is moving around and it sure is hurting,” but without listening to the mule, you didn’t know and now you and your mule are in for a rough ride. On a mule or donkey, using one cinch is just asking to have the saddle roll. Folks, two cinches – loose in the front and snug and secure in the back. The name says it all… which way does the pulling collar pull? FORWARD! Folks will use a fixed breast collar and every time that mule takes a step forward, his shoulder bumps the strap, and that, in turn, moves the saddle forward. The breast collar is meant to keep the saddle from going backwards – not pull the saddle forward. If you have a properly adjusted breeching and a properly adjusted breast collar, you will find they help keep the saddle in place when you’re riding down the trail. You want a breast collar that allows for full fluid movement from the mule up front. You want a free-moving breast collar that utilizes a pommel strap system – in this way, the breast collar does exactly what it is meant to do – prevent the saddle from going backwards, not the opposite! You can do everything in the world right – use the mule saddle, mule saddle pad, ride with a properly adjusted breeching, ride with a properly adjusted breast collar, and ride with two-cinches… it will never make up for any conformation defects in your animal. It is imperative that you understand the mule’s conformation is also one of the problems with the saddle moving. Too fat of a mule and it’s going to be really difficult to keep a saddle on. Nothing you do is going to fully compensate for a too fat mule. Nothing is going to 100% compensate for a mule with a downhill hip, either (here is the best I’ve been able to do with downhill hip). Conformation is extremely important when talking about how to keep the saddle on and prevent it from moving. Don’t buy a mule because you pet him and he was sweet as peach cobbler – look at the conformation. If you don’t know what you’re looking at, get with someone who does. If you care about your mule, you must have everything correct. Riding a mule without the right setup is like riding in a car with bald tires, going down the road thinking that everything is going to be alright. I have four decades of experience and have learned that there are no shortcuts. 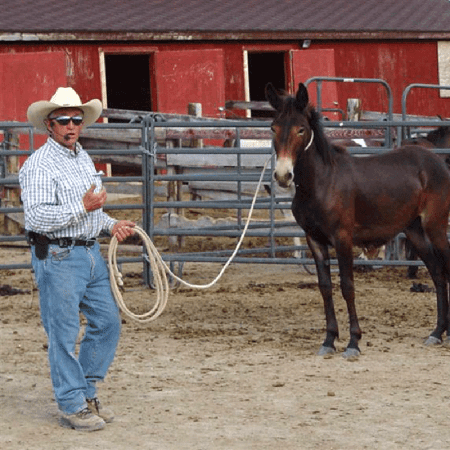 If you care about your mule, do it right the first time – and if you’ve been doing it wrong… then repeat after me, “The past is the past, I’m free at last.” You can use my four decades of experience and do it right or you can listen to someone who has been working with mules for two or three years and has limited experience. Folks with limited experienced don’t see the major differences between punching cows or riding down the trail for a nice afternoon out. It is imperative that you become the herd leader, this animal is looking to you for help and leadership. If you don’t want to take the time to understand the mule, don’t own one. If you’re willing to take the time to do it right, then the list below is for you. Now, with that list, you’ll find on my store alongside the traditional leather I sell (which is an old-timey leather), I also sell beta products. I have fallen in love with beta because it is maintenance free, easy to clean, light, looks great, and is STRONG. Beta is measured at 650 psi compared to leather which measures 250 psi. If you’re more of a traditionalist, well, maybe go with the leather – I choose to ride beta. Don’t take shortcuts. Don’t assume you’re mule is okay. Don’t believe that your mule, donkey, ride, or tack is the exception. Do listen to your mule. Do listen to experience. Do go about things right by your mule. If you have any questions, I sure would like to help you. 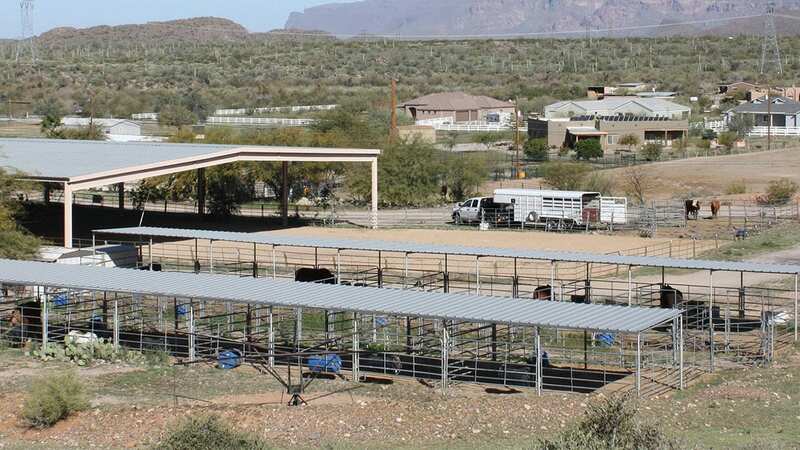 You can call me at 602-999-6853 or send me an email at support@muleranch.com. Bottom line – your new saddle will work as designed when you use the appropriate tack and accessories. You will see a huge difference in your mule or donkey and they will be much happier riding down the trail.